In 1975, Sydney Pollack and Robert Redford played a tense spy game called Three Days of the Condor. But in 2009, as the film sees its Blu-ray debut, it’s hard for this gen x-er to take the tension seriously. It’s still fun, but it has a dose of camp that might not have been intended 30 years ago. Three Days of the Condor is a classic Hitchcock-style thriller: a normal man gets caught up in events beyond his pay grade. He must take matters into his own hands to survive and set things right. Robert Redford plays an academic. He works among the tweed in a converted genteel brownstone. He reads for a living — books, magazines, anything — and then reports to the CIA any surprising trends or codes or ciphers. Returning from lunch, he discovers his colleagues have been gunned down. Now he has to find out why they were targeted, and whether to trust his life to his CIAs superiors whom he’s never met. He takes a woman hostage in trying to escape some suspicious-looking spooks. She warms to him and then decides to help him. The story is just as suspenseful as the modern day Bourne movies. 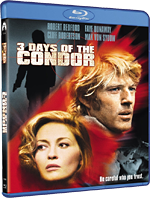 But Three Days of the Condor is much slower paced, which might frustrate younger audiences. Personally, I like the rhythmic contrast; I like the “white space” that lets you work out what’s going on. The Bourne movies work hard to keep the plot moving in every scene, whereas Three Days of the Condor has a more pensive approach to solving a conspiracy. Really, the movie is mostly about the chase. But the MacGuffins are energy production and the flow of information, two topics that are still timely today. These larger themes help the movie seem less anachronistic. They make the movie seem prescient, or at least tuned in to the problems of the day. It also helps that there is a satisfying ending that leaves just a hint of uncertainty. There are some scenes that really don’t play well. Faye Dunaway gives an unconvincing (or at least uneven) performance as the kidnapped woman. Maybe it’s not Dunaway; maybe it’s the script. It’s hard to accept how severe her case of Stockholm syndrome is. After this creep (granted, he looks like Robert Redford) kidnaps her at gunpoint and forces her to bring him into her home, they have a nice quiet evening together, followed by a nice hot night. The disco-influenced jazz score from Dave Grusin sets the era; it’s hard not to chuckle at the funk with strings. And then there are the halo silhouettes filmed in soft focus with a star filter glinting off Redford’s lower lip. Some of this ’70s stuff looks silly, but it’s not out of place within the context of the movie. The computer-fascinated scenes at Redford’s office are fairly believable for the time (and for a movie), but so dated as to be distracting. What hasn’t aged is the near-pristine print. The film has been surprisingly well preserved. There is very little noise, and in fact it might possibly be better than Enemy at the Gates, which is only 8 years old and which came out on Blu-ray at the same time. Three Days of the Condor features some now-nostalgic shots of NYC in the 70s with plenty of shots of — and even from — the twin towers. There are no extra features on this Blu-ray release. There’s only one thing to do, and that’s watch the movie.